Enjoy this safari in Kruger National Park where you can experience the thrill of walking in the bush and game driving amongst the wildlife of Africa. The diversity of wildlife this safari offers is an experience you will always remember. You may experience an acute adrenalin charge when in the presence of the African animals. 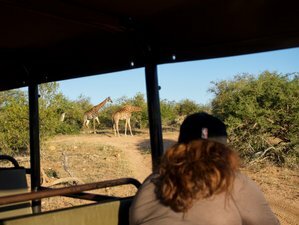 Listen to the wildlife sounds and admire the stunning views during your game drive! Children policy: 16 is the minimum age allowed for participating in a bush walk. Viva Safaris collects you from your hotel or O. R. Tambo International Airport (JNB) and travel via Dullstroom to Marc's Treehouse Lodge. There, you board an open Landcruiser for a sunset drive on Motlala Game Reserve. After dark, spotlights are used to locate nocturnal animals. Dinner and overnight at Marc's Treehouse Lodge. You travel in an open-sided game viewer to the Orpen area of Kruger Park. The added elevation and absence of windows allow for excellent viewing and photographic opportunities. Your qualified guide will show you various animals, large and small, that frequent this outstanding wildlife paradise. The zone of Kruger you visit has the highest percentage population of giraffe, zebra, wildebeest, and impala that attract numerous lions and other predators. You will enjoy dinner and stay overnight in your fascinating treehouse at Marc’s Treehouse Lodge. You have an early morning bush walk accompanied by an armed ranger. You will be shown various interesting details of the bush, including insects, spoor, and cats. You have an excellent chance of encountering nyala, buffalo, and other game on foot. After breakfast, Viva Safaris drives to the Three Rondavels of the Blyde River Canyon. Viva Safaris returns you to your hotel or airport at around 17:00. In Kruger National Park, nearly 2 million hectares of unrivaled diversity of life forms fuses with historical and archaeological sights; this is real Africa. The world-renowned Kruger National Park offers a wildlife experience that ranks with the best in Africa. Kruger National Park is one of the largest game reserves in Africa, covering an area of approximately 20,000 square kilometers. This safari will provide you breakfasts and dinners. You will also enjoy an unforgettable bush braai in the Marula Tree Boma deep in the African bush.